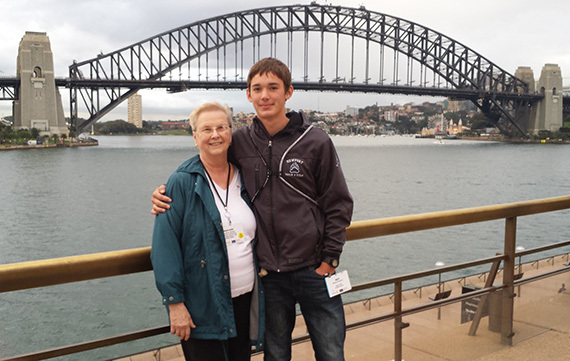 Harriett Schloer and her grandson, Will Beaudry, in Sydney Harbor. Since 1998, my husband and I have only missed three Rotary conventions. We have both come to look upon the convention as our annual vacation with the opportunity to visit many foreign countries and revisit some of our favorite places in the United States. 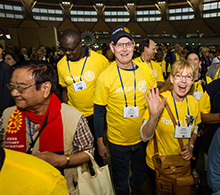 Rotary members make connections in the House of Friendship during the 2014 Convention in Sydney. I grew up in Sydney. 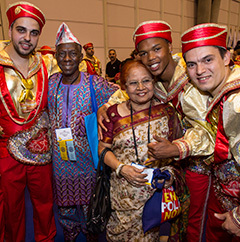 So attending my first Rotary convention last year in Sydney was less about the location and more about meeting people from all over the world. The opening plenary session on Sunday was highlighted by Australian Prime Minister Tony Abbott’s announcement of his government’s $100 million contribution toward polio eradication. RI President Ron Burton gave his keynote address and Human Nature, one of Australia’s most popular music groups, performed music from Motown. I got goose bumps when the prime minister told us about the $100 million their government will give toward polio eradication. Rotary loves this. It was really amazing and an honor for us. I thought Ron Burton’s speech gave us power to increase membership. This is my first convention so I had no idea what to expect. I was blown away. I felt like crying half the time. I was amazed to learn about what Rotary has done around the world. It was moving. Obviously, the $100 million contribution fantastic. When Burton talked about loving Rotary and our work is all about who we are. I know there are times when you feel stressed and overworked but you should remember what is at the core of what you’re doing for Rotary. It was an inspirational thing for me to think about. The best part was definitely when the prime minister spoke. What an honor for Australia to donate $100 million towards our primary cause. It was also very informative. I learned a lot about fellowship, friendship, and service. The videos and images gave a great visual of what we do and who we are. I think we are all aware of some of the membership issues facing Rotary. I was glad to hear President Ron speak so bluntly about where we stand and what we need to do to ensure our future. I thought Human Nature was too loud and went on a little long, but all in all, a great event. It was awesome. The presentations were very good. I wish I could listen to the prime minister’s speech again. I thought it was quite rich and thoughtful. The dance troupe [North South Wales Public Schools Aboriginal Dance Company] was terrific as well.